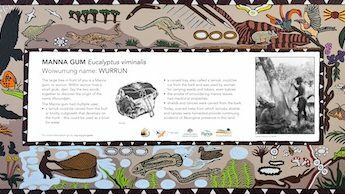 The Wurundjeri used bracken fern as a mattress, an ointment and for making bread. They used the springy, leathery fronds of the bracken fern covered with soft, possum skin rugs, for bedding. The juice of the young stems is poisonous and was not eaten, but provided immediate relief for insect stings and bites. Underground stems, called rhizomes, were fibrous and starchy, and when roasted and beaten to a paste could be made into a type of bread. Bracken is a global plant growing in all but the harshest of desert environments. The bracken which is native to Australia is Austral Bracken, Pteridium esculentum. 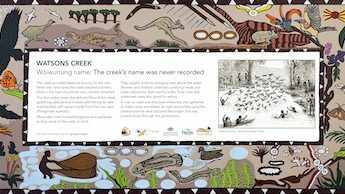 Bracken is found widely in Australia especially in forests along creek margins. It is sometimes mistakenly considered an introduced plant as it is found in many parts of the world. Austral Bracken is native to Australia. Bracken is poisonous to cattle and sheep because it contains a carcinogen, ptaquiloside. Reproduction takes place through the distribution of spores and also through the spreading rhizomes which travel extensively underground. Rhizomes are underground stems which grow roots and nodes from which the leaves shoot. The mature green tops arch over the ground and make a microclimate which favours a number of native insects. The underground stems (rhizomes) are fibrous and starchy and it was these that formed a staple food for the Wurundjeri. They were gathered in Summer and Autumn. New shoots developed in Winter so harvesting was managed sustainably. If hunters were unable to find animals for meat, the starchy rhizomes of the bracken could sustain the clan for a short period. These starchy rhizomes needed to be prepared and cooked before they could be eaten. They were roasted then beaten to a paste and baked as a kind of bread. The cooking is thought to have destroyed the toxins. The rhizomes were also dried, making them lighter when carried by the clan as they travelled. The young fiddlehead shoots look edible but are now known to contain a carcinogen. 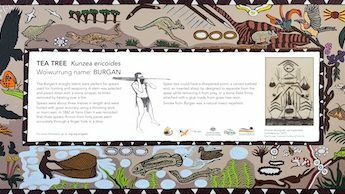 The Wurundjeri soaked them for 24 hours and removed the fine hairs and the poisonous effects but they still needed to be cooked. The had a nutty flavour. The sap of the young, juicy stems was rubbed onto stings and insect bites. Bracken leaves are coarse and leathery. They were gathered and used as a springy mattress in a willam, a bark shelter. They were covered by a possum skin rug to make a comfortable bed.